Hewlett-Packard's Unix team has rolled out a fresh release of the HP-UX operating system, and has yet again fiddled with the various flavors of the software that customers can acquire. HP-UX 11i v3 Update 2 (no, seriously) features some tweaks to the kernel and elsewhere, providing what HP claims is a 20 per cent performance boost over v3's initial release. HP also claims Update 2 can double the network speed for certain workloads. The biggest change, however, is arguably how HP is dividing the bundles for its Operating Environment (OE) packages. For those keeping score, HP has already offered HP-UX in several different degrees. Previous versions were divided into: Foundation OE, Enterprise OE, Mission Critical OE, Technical Computing OE, and Minimal Technical OE. In a nutshell, Foundation was the basic OE, Enterprise added virtualization, Mission Critical had virtualization and clustering software, Minimal Technical OE was a chopped-down version of HP-UX for workstations, and Technical Computing OE was Minimal OE with added graphic applications and math libraries for compute-intensive workstations. HP has now divided its HP-UX offering into four new parts, which the company reckons makes the whole proposition more digestible. 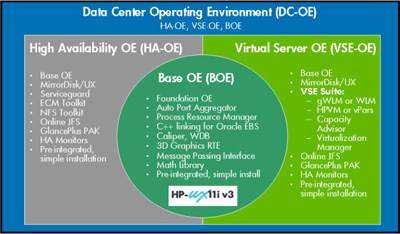 Base OE: provides the HP-UX 11i operating system just like Foundation OE. Virtual Server OE: adds HP's VSE suite of virtualization software. High-Availability OE: provides HP ServiceGuard clustering and other HA software for business-critical applications. Data Center OE: is the whole shebang. Everything in HA-OE and VSE-OE bundled into one. The major difference being that a customer can get clustering software without buying virtualization software they might not need. Here's HP's own page detailing the differences. Update 2 is available on both HP 9000 (PA-RISC) and Integrity (Itanium/Itanic) servers now. HP still intends on releasing further updates every six months, and major new version revisions every three years.